For Laurel, we specifically selected pieces with accessible and roomy pockets- for storing tools and whatever else she might need handy. The most important features for this season focus on the practicality and functionality needed as a maker & artist. Laurel is an absolute joy to know…an artist and maker whose passion and joie de vivre is contagious. Her roots in Michigan are deep- she comes from Marquette in the Upper Peninsula and grew up living off the land. A talented metalsmith and jeweler, we often rubbed elbows with at summer festivals as well as at the Conscious Clothing studio. Laurel inspires us with her sustainability- and she sources many of her stones and materials from Michigan and uses only recycled materials. 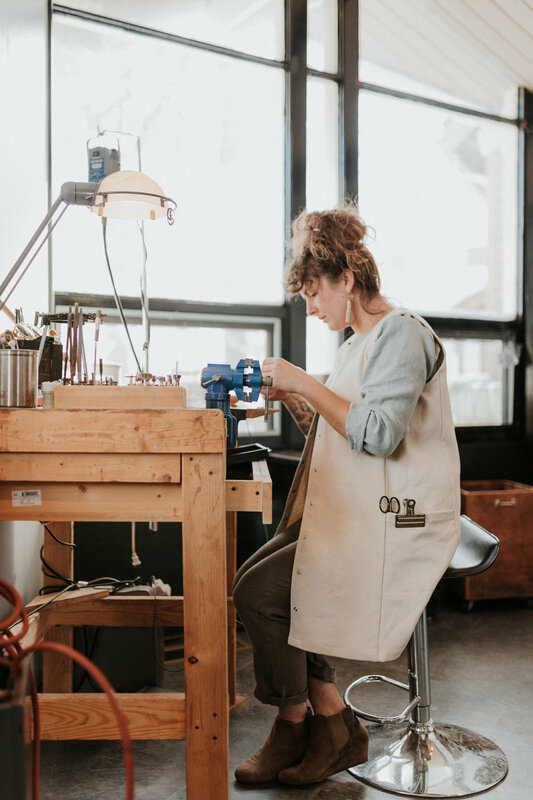 She currently is working out of a collaborative studio in Grand Rapids Michigan, where we stopped to see what she’s working on. Tell us a little bit about your story - how did you get where you are today? I attended NMU from 2006-2012 receiving my BA in Art, concentration Metals. Directly after I was hired by Beth Millner of Marquette, MI where I worked and learned more about jewelry making and the running of a small business. Later I moved to Northern California where I started my L.A.M. Jewelry business out of my apartment. After moving back to Michigan, I continued with a home studio, online sales, and some shows. Two years ago I decided to make the move to GR where I set up shop with The Hot Spot metals studio & worked for Conscious Clothing. I am now a yoga teacher, server at Brewery Vivant and self employed jewelry/metals artist. Yoga, breakfast, coffee for the short commute to the studio and then working on custom orders & inventory for upcoming shows and events! Days do vary thought the week with some dedicated to teaching yoga, some for working at the brewery and others dedicated solely to jewelry making and marketing. My Jewelry is influenced by the shapes, colors and lines found in the woods & rural areas I have called home. My inspiration has come from the Upper Peninsula of Michigan to the mountains of Northern California & many places in-between. My work consists of handmade recycled precious metal & multi media wear made with integrity & love. Tell us about your craft. What tools do you use? What is your process? How long does it take to complete a piece? Working with recycled metals and a variety of mixed media form feathers to wood to rocks and minerals. The whole process involves a wide assortment of tools including saw, saw blades, hammers, torch, stamps, sanding blocks, acid bath for cleaning metal (pickle), anvil, patinas, paint brushes, and steel wool. These are just a handful of examples. As for process I do very little sketching for work I will include in inventory. I like to allow the piece to evolve as I am working the materials, deciding as I go whether to add texture or to leave smooth, whether to patina a surface or polish it to a mirror finish. The thing I do determine before sitting down at the bench is simply what type of piece I am making, bracelet, earrings, ring...etc. With custom work I consult with the customer to design exactly what they are dreaming up. Describe your space? How does it work for you? Are there any challenges? The Hot Spot is full of light and everything I need for my creative process. The tools are easy to access and with a group as conscious and knowledgeable as we have the equipment is well taken care of. We share space, tools and ideas freely! It is a pleasure to work there! The challenges I face are in honing the skills I am ever developing as I meet each project. What do you usually wear to work on your craft? What makes a garment function well for you? How do you interact with your clothes while working? My attire is casual and comfortable, cotton is important as it resists fire which is in use constantly during soldering. It is also important to have pockets for stashing frequently used tools and my phone which is constantly playing one podcast or another. I also don my apron as soon as I sit down at the bench. As you know, Conscious Clothing is all about being conscious about our consumption and how we interact with the earth. How do incorporate eco or sustainability practices into your life? In my work I use only recycled metals which through scrap/dust collection are reused for more projects! My whole life sustainability has been of importance. Growing up with parents who lived off of the land in many ways. Much of our food coming to us from large scale organic gardening, some foregging and my father being an avid hunter and fisherman. We compost, recycle and do our best to leave the smallest footprint possible behind. Now living in a large city I also do my best in these areas. I work for a company that is a B corp. in a LEED certified building. I cook at home with much of the produce I help harvest from my family gardens up north and the meat my dad still graciously provides me. I walk or ride my bike to work depending on the weather almost every day and avoid use of earth harming home goods. You are a fellow West Michigander, do you have any favorite places or things to do in Michigan? Any adventure I can have outside, near the lake, on a trail or just tromping through the woods. I love to ski in the winter and swim in the summer. Exploring all the lovely little towns along Lake Michigans shoreline is a treat when there is time made. What are your favorite pieces in the Conscious Clothing collection? The overall I have I wear a few times a week in the summer and my hemp hoodie dress is also a favorite! If I'm lucky enough to have an event to dress up a bit I like to wear my Copenhagen Tunic with a bold necklace or earrings and some boots! ALL images by the fabulous Leigh Ann Cobb.